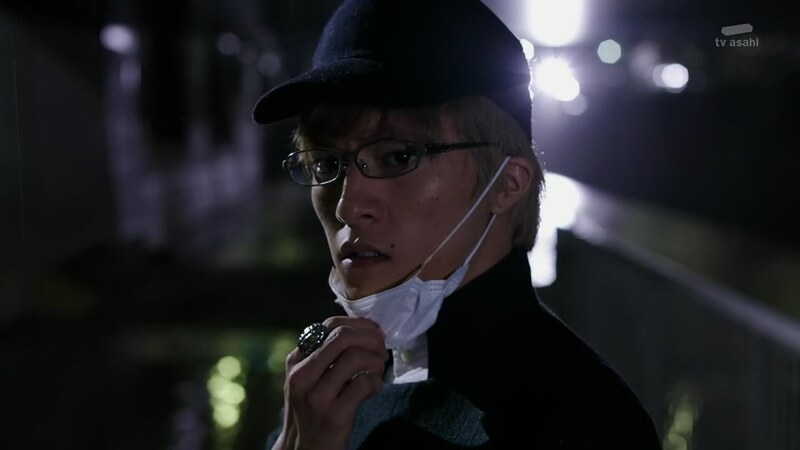 Recap: Kamen Rider Drive, Episode 42 – What is the Truth About the Goddess? Shinnosuke deduces that Medic had no intention of hurting anyone by bringing Misuzu to the hospital. Instead, Medic hoped she would wake up. Medic explains that as she was looking for a body to copy after the Global Freeze, she was drawn to a strong emotion. And as she copied her, Medic also learned what was in her heart. Misuzu had an intense drive to help those she loved over helping herself. Medic was intrigued so she healed her wounds and saved her life using the power of pure, unconditional love. She then proceeded to heal other Roidmudes, but as she did, she also absorbed the dark feelings those Roidmude had learned from the humans. Medic says she fears that pure love that granted her this power is gone. 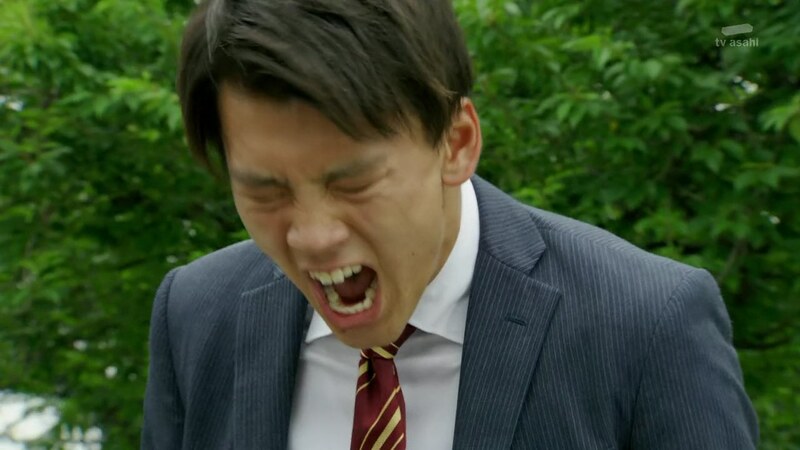 But Shinnosuke knows Medic hopes Misuzu can awaken and allow her to regain that heart. The key to that is Shou. Shinnosuke promises to find Shou for her. Belt-san and Chase don’t understand Shinnosuke’s craziness. But he says it’s not just for Medic, but for all the women who lost consciousness. Banno appears and reveals himself as Gold Drive. Shinnosuke and Chase henshin. But Banno easily grabs all their weapons and uses them against them, forcing them to dehenshin. Medic refuses to go with Banno, but Brain says he is their ally. Banno offers to restore her base emotion and help her Ultimate Evolve. Shinnosuke tries to get Medic to turn the offer down, but Banno whisks them away. Back at the Pit, Gou is livid that Banno so casually disregards their family. Shinnosuke goes to the ballet company where he learns Igarashi actually wasn’t Misuzu’s boyfriend. Sure enough, Kyu digs up info that Igarashi actually embezzled money from the ballet company. Across town, Igarashi is about to kill Misuzu by rolling her wheelchair down the stairs. 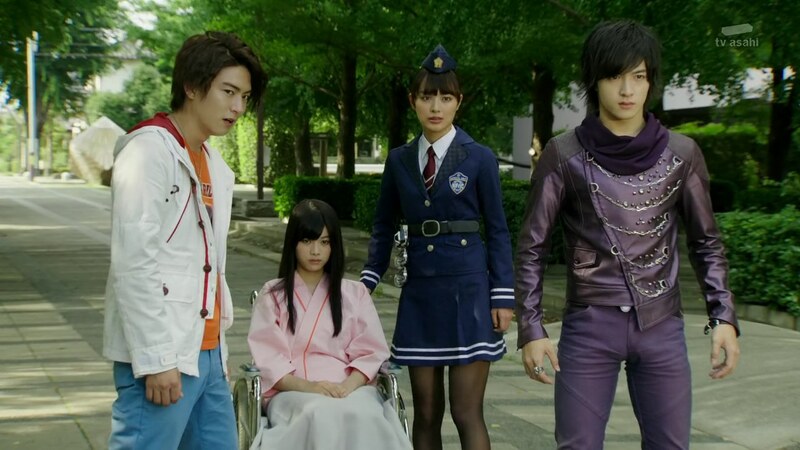 But Shinnosuke, Otta and Kiriko arrive just in time. Igarashi laughs hysterically and admits that he ran her over with his car to keep her from turning him in to the cops. When Misuzu disappeared, he thought he was so lucky. But not anymore. Otta takes him away. Meanwhile, Heart asks Brain where Medic is. Brain gets on his knees and apologizes. Medic is with Banno who tells her he has removed all the impurities from her heart which should allow her to feel that pure love for Heart and Ultimate Evolve. Brain says he is a foolish, cowardly man for allowing this to happen and will accept any punishment Heart sees fit. Heart says he will make him disappear then. 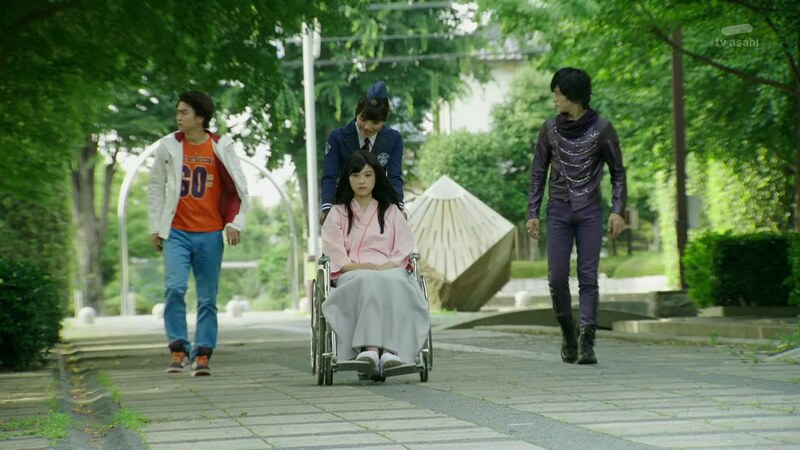 Kiriko, flanked by her bodyguards, rolls Misuzu back to the hospital. But an all-white Medic stops them. Medic says she no longer has any use for Misuzu after Banno guided her to her Ultimate Evolution. 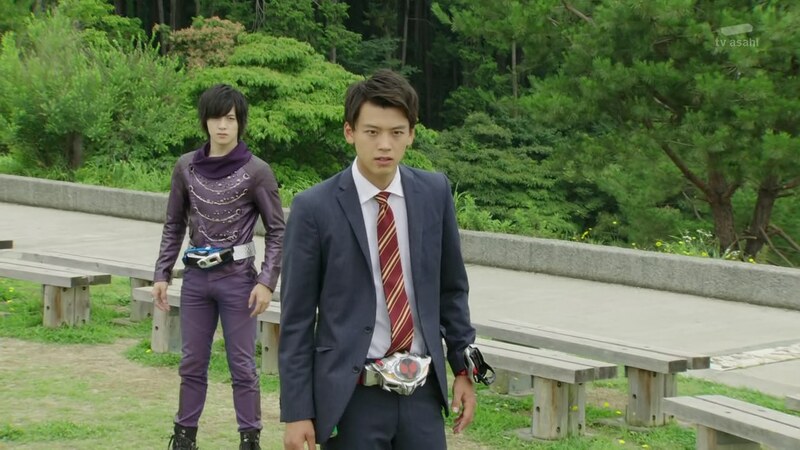 Gou and Chase henshin. Medic just laughs and goes Roidmude form. They fight. Medic wonders why she is not evolving. Heart appears and Medic can’t bear to have him see her looking so pathetic. 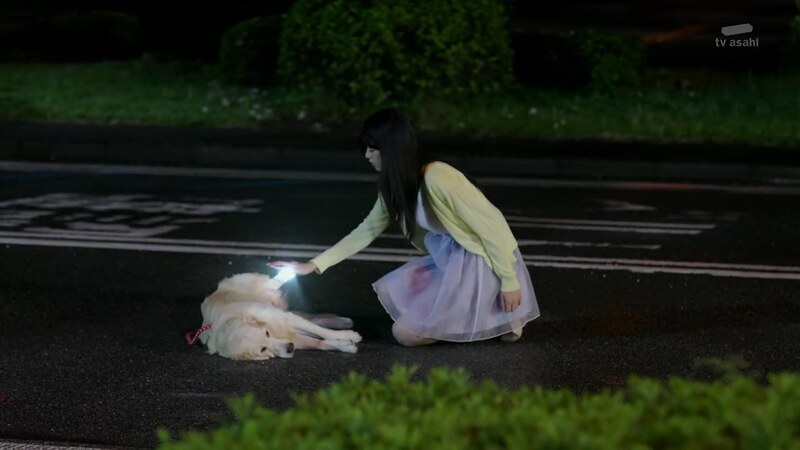 Just then, Medic’s dog comes running toward Misuzu. Turns out this dog is Shou. Misuzu comes out of her stupor and hugs him. Brain realizes why Medic had been taking care of the dog (that only popped up 2 episodes ago) all this time. Turns out, Misuzu had been walking her dog when Igarashi ran them over. Medic saw the dog and decided to heal him too. The strong sense of unconditional pure love that Shou felt for his owner Misuzu is the emotion that she fused with and the same emotion she feels for Heart-sama. Remembering that moment allows Medic to finally Ultimate Evolve. She fires at Gou and Chase, causing them to dehenshin. Heart is happy Medic has finally evolved as well, but she suddenly starts to short circuit. Banno explains that he made it so as soon as she reached Ultimate Evolution, she would have her mind and heart erased to become his puppet. “I did it all for Heart-sama,” she repeats. 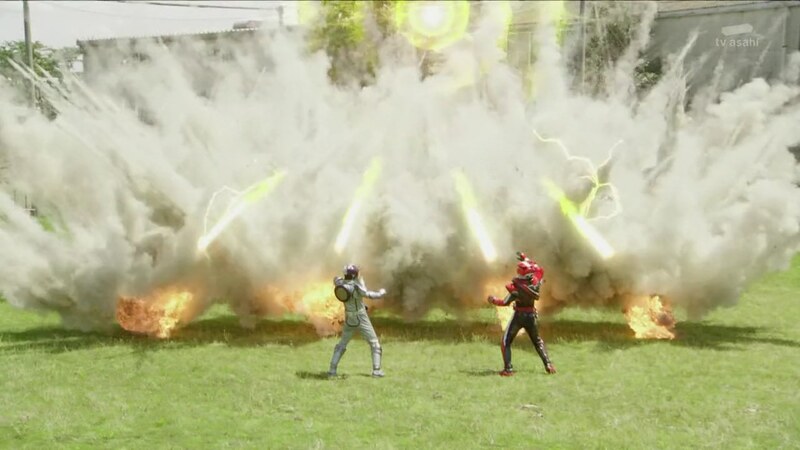 Heart will not stand for this and runs to attack Banno who orders Medic to stop him. 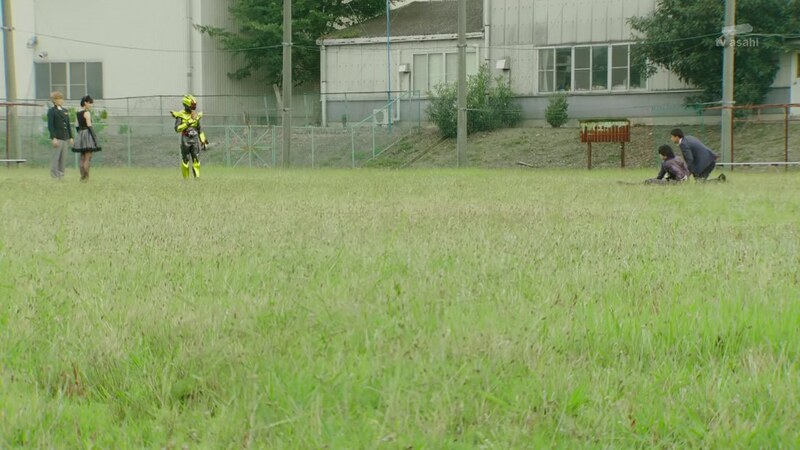 Shinnosuke tries butting in, but Medic handles him easily. 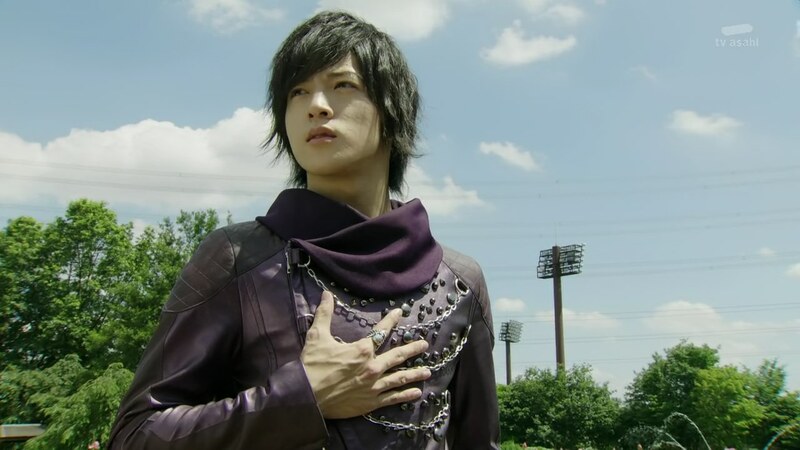 Banno orders Medic to kill all Kamen Riders, but Hearts absorbs the attack instead, protecting the guys. He walks over to Medic and says this is not the way he wanted to fight. Banno whisks Medic and Heart away. Brain also leaves. Anyway, Misuzu thanks Shinnosuke for returning Shou to her. Kiriko asks how Tomari-san was able to figure it out. 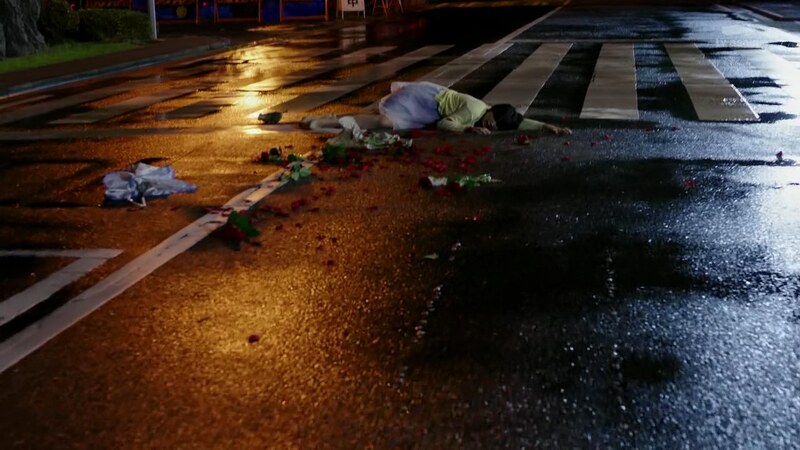 Shinnosuke says he remembered all the victims loved dogs. Like Rinna. Chase sees all the loving around him and confirms to himself that yes…. 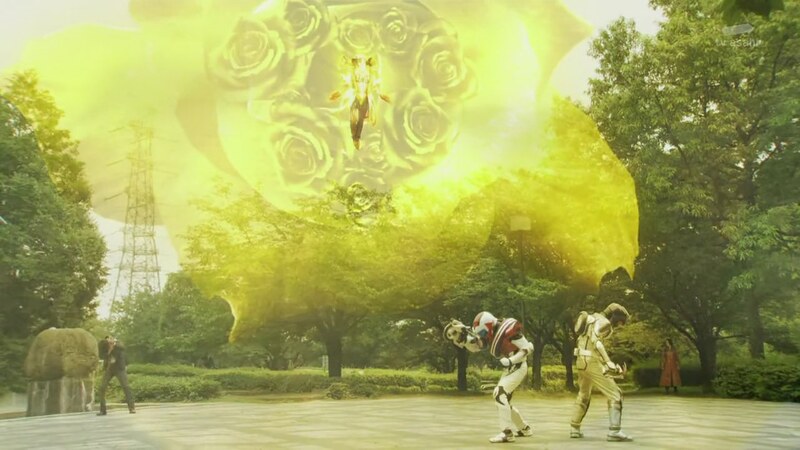 On the rooftop, Banno says that this Gold Drive form is his Ultimate Evolution. So now they have the four that gives them the Promised Nmber. Banno offers to be their leader to initiate another Global Freeze. But Heart says they have not gathered as there are only three of them. Brain is downtown, disguised. 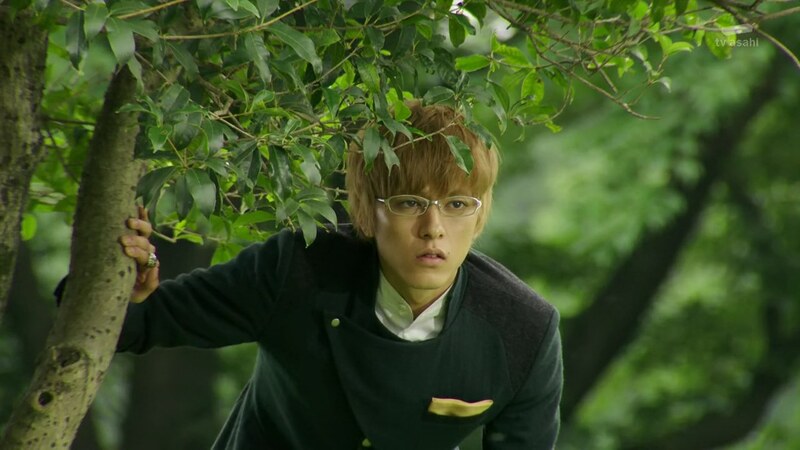 He remembers Heart telling him that he would disappear as to hinder Banno’s plans. As Brain walks away, he remembers all the times Medic was a huge witch to him. And yet after all that, why does he still feel pity for her. 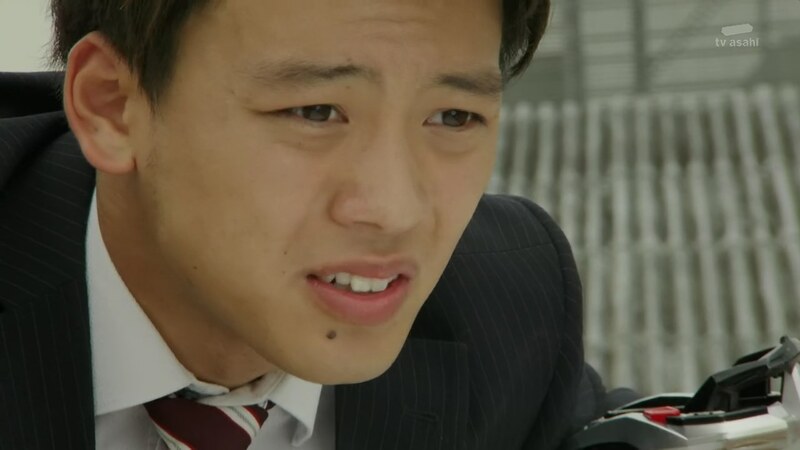 Next day, Shinnosuke watches from the roof as Chase is about to admit his feelings to Kiriko. Another okay episode that’s really months too late. Again, they’ve really dropped the ball with a great concept. The overall theme appears to be human emotions and how these robots have learned to feel them. But for a season that’s all about emotions, a lot of the plot is pretty emotionless. They could’ve easily spent two (earlier) episodes just learning about Misuzu and expanding on Medic’s character just like they could’ve done with Heart and his human and Brain and his human, etc. 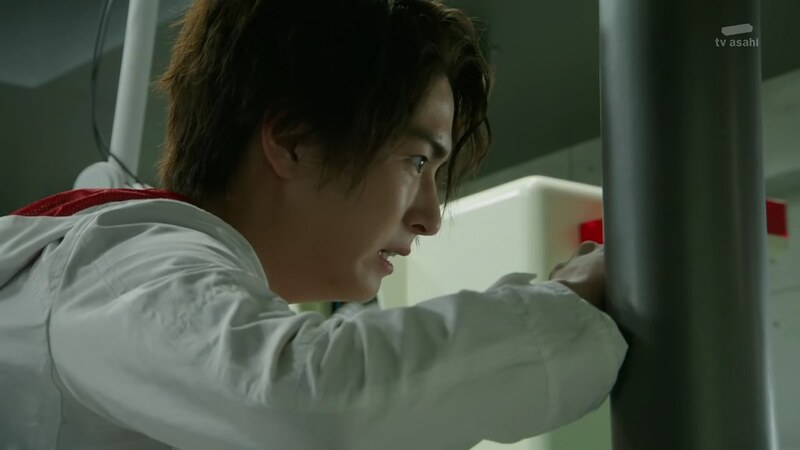 That “emotion” angle could’ve also made the Banno/Gou/Kiriko plot feel more powerful and strong. Building that family theme up more before demolishing it with Banno’s betrayal would’ve been some great story. 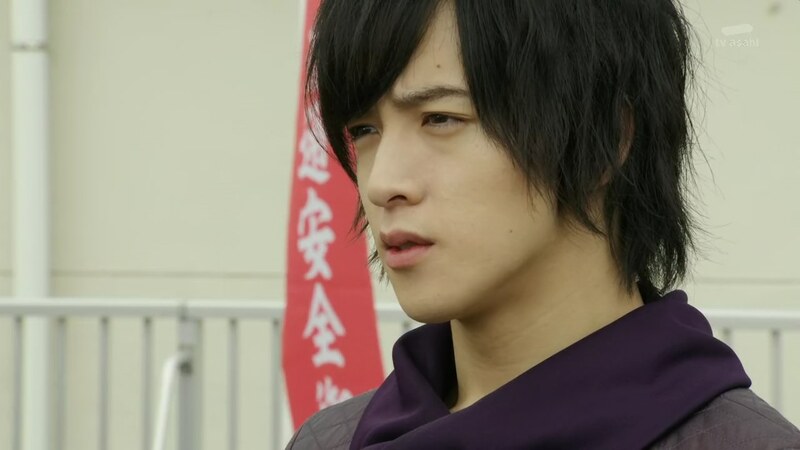 As for Chase, they could’ve easily developed him to encompass all the various emotions that the other Roidmude apparently only individually absorbed. 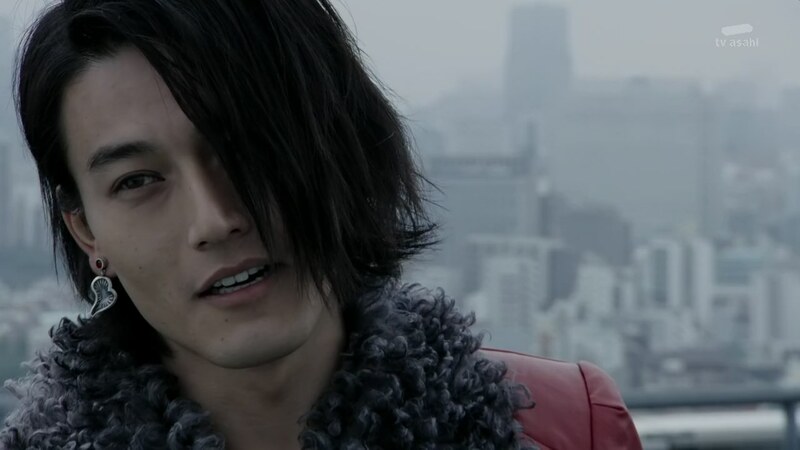 Have Chase be the Roidmude that becomes a “real boy.” Instead, it seems he’ll just be Kiriko’s new boyfriend. And this was after the entire middle section made the season appear to be Kamen Rider Chase instead of Drive. ← Recap: The Amazing Race Canada 3, Episode 7 – "I'm sorry to tell you your sticks are wrong." We’re starting to sound like a brokedn record here, but really, they should have just gone with this one instead of the whole Makage arc. While that arc did indeed have a more fleshed out villain, none of the plot points from there actually matter here. It’s just like a massive filler arc to introduce Type Tridoron. I loved this episode and if Chase does become Kiriko’s boyfriend he would still protect her so their relationship won’t change it would become more adorable.